The Potter Valley encompasses the most northeastern area of the Russian River watershed and the headwaters of its east fork. Since 1908 the Potter Valley Project has shunted water from the Eel River into the East Fork of the Russian River to create electricity. This tunnel has provided abundant water to Potter Valley where alfalfa, winegrapes, and even rice have been grown. Downstream, the Coyote Dam blocks returning steelhead trout, making resident rainbow trout the primary fish in the valley’s streams. 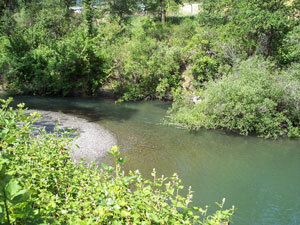 Tributary streams include Adobe, Boyes, Busch, Bevans, Burr, Mewhinney, Williams, and White Creeks. This site surrounds the outlet of the Potter Valley Project tunnel and thus the headwaters of the Russian River. An organic grower, Guinness McFadden’s property is biologically rich with numerous streams with riparian forest interspersed among irrigated lands, as well as dry hillsides with native drought-tolerant species such as blue oak, grey pine, and manzanita.